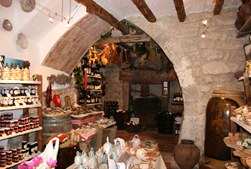 Our shop is not simply a place where honey, sausages, cheese and wine are sold. The walls of Casa Guimera hold centuries of history and tradition that open up to all who wish to visit. Find online the most popular products from our store and approach to discover all our variety. The Honey Shop is located in a 15th century building that still conserves its original structure, with stone walls of more than a meter wide and floors made of flagstone There is a gothic arch, and also a medieval well made of piled stones that collect water that filters from the ground as well as humidity from the walls. The visitor can contemplate antique tools used daily by the farmers to work on the land or in the home. The products for sale in the shop are decoratively displayed together with the old tools that were used to make them years ago. All around the store are panels with simple explanations of the complete elaboration process for honey and cheese. The products that are sold in Casa Guimerà can be tasted for free in various areas of the store. Honey, cheese, sausage, wine, liquor, raw brandy, chocolate, sweets... An excellent opportunity to choose what you like the best.